Formerly known as the Plaisance Airport, it is the main international airport in Mauritius located 48 kilometres towards the southeast of Port Louis. It houses direct flight to Europe, Africa and Asia, and it is also home to the national airline of the island - Air Mauritius. It is owned and operated by the Airports of Mauritius Co. Ltd. (AML) and the Government of Mauritius being their significant shareholders. Initially, the airport was much smaller in an area and constructed near Mahebourg at Plaine Magnien back in 1942, which was used primarily to import goods from the United Kingdom's and its various colonies. During the Second World War, it was used as a military based and right after the war ended, the Mauritian economy gained a boost as it became an operational civil airport. The full-fledged infrastructural works began later in 1986 with the construction of terminal and airbridges to accommodate larger aircraft. The present design of the SSR International Airport is derived from the Mauritian tropical plant 'Traveller's Palm' which can capacitate more than 4 million passengers. 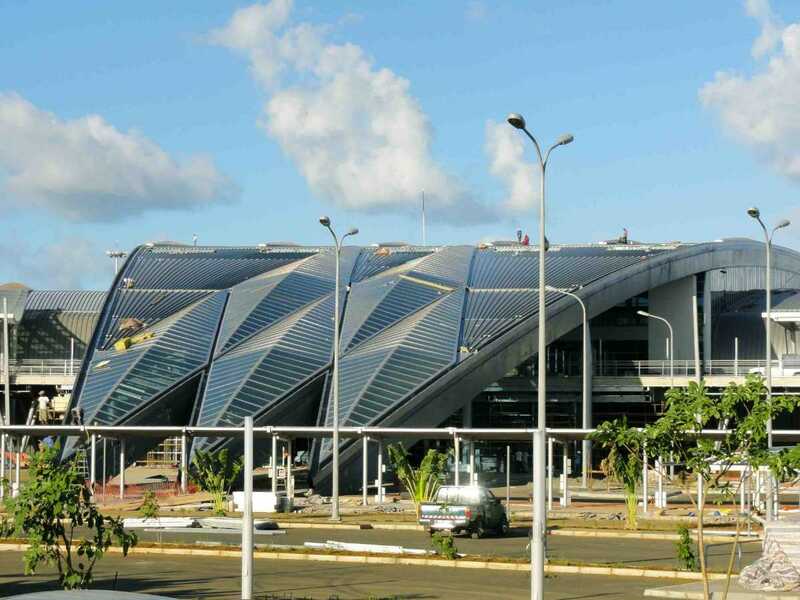 Airport Terminal Operations Ltd. (ATOL) designed the new building keeping the ecological and environmental aspects in mind; hence the use of solar energy to derive power, rainwater recovery, etc. can be found. The terminal covers 57,000 square metres with five boarding gates equipped and includes immigration counters, check-in desks for passengers and baggage carousels. There are nearly 23 operating airlines that arrive and depart from the airport to different parts of the world. This airport in Mauritius has facilities like ATMs, food courts and restaurants, in-airport shopping space and luggage reclaim hall, along with a 24-hour parking capacity of 600. Shandrani Resort and Spa, 6 kilometres from the airport. Passengers coming from Mahebourg should take the A10 Road, drive for 6 kilometres westwards and follows the signs that lead to the Sir Seewoosagur Ramgoolam International Airport. For those coming from Port Louis should head in the SE direction on the M2 Road for 40 kilometres and follow the signs to the airport after that. Car rental companies like ABC, Budget, Europcar, etc.offers their services in the airport's Tour Operators' Hall. Public buses run between Port Louis to the airport every day at regular intervals of half an hour and cost about INR 300 per person and it is a 60-minute journey from the bus station to the terminal. Taxi services from Port Louis take about 45 minutes and costs around INR 1500. The Rodrigues island hosts the second airport in Mauritius, and it is located at a place called Plaine Corail. Before being renamed in 2007, the Sir Gaetan Duval Airport was known as Plaine Corail Airport, and following to that, it was named after the former Deputy Prime Minister of Mauritius Sir Charles Gaetan Duval who was responsible for the development of Rodrigues Island. The airport has been undertaken by the public company Airport of Rodrigues Ltd (ARL) since 2000. The Sir Gaetan Duval Airport is a public airport, and as recorded in 2006, it had a capacity of 49,500 passengers. Mainly two airlines - Air Mauritius and a seasonal Air Austral - are operating in the airport. The asphalt runway of the airport has dimensions of 1287 by 30 metres. Bus service from the town Port Mathurin to the airport start from 6 AM and the last bus departs at 4.30 PM. The duration of the journey is 35 minutes, and it costs INR 29 per person. Taxis in the form of cars, trucks and SUVs offer transportation services to any part of the island from the airport bus station and can be identified by the yellow sign on the top of the vehicle. For each scheduled flight, shuttle bus services are available from the airport to different parts of Rodrigues with a price higher than the public transport as it provides door-to-door service. Book your Next flight and fly to one of these airports in Mauritius and start your Mauritian holiday!! Renting A Car In Mauritius: Drive By The Coast On Your Next Vacay! 10 Water Sports In Mauritius You Don't Want To Miss!